Published: Sept. 8, 2014 at 12:38 a.m. Updated: Sept. 15, 2014 at 02:59 p.m. The waiver wire is one of the most important keys to finding success in the world of fantasy football. Each week, I'll offer up 10 players you need to target off the free-agent market as you look to reach your ultimate goal - winning a championship! It was Forsett, not Bernard Pierce, who led the Ravens in backfield touches in their opener against the Cincinnati Bengals. The veteran looked good, too, as he rushed 11 times for 70 yards and scored on a 13-yard run. Forsett, who also caught five passes, could wind up being the best Ravens runner heading into a Week 2 battle against the Pittsburgh Steelers. 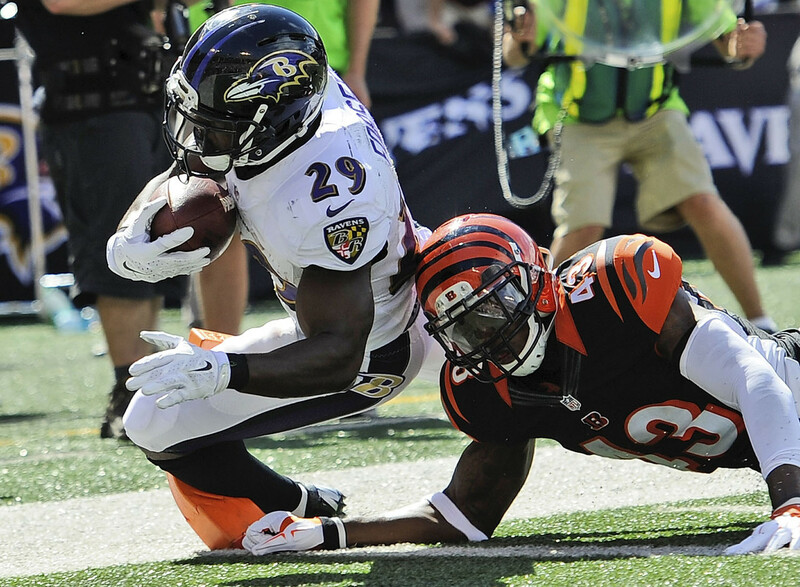 Now that Ray Rice has been cut from the team, Forsett may play a bigger role than expected for the Ravens this season. In a week where rookie wideouts shined, Benjamin looked like a veteran with six catches (eight targets), 92 yards and one touchdown in a win over the Tampa Bay Buccaneers. A huge target at 6-foot-5 and 240 pounds, the Panthers have a lot of faith in him despite his lack of NFL experience. While there are no guarantees with rookie receivers, Benjamin has upside and now needs to be on rosters. Locker looked good against the Kansas City Chiefs, throwing for 266 yards and two touchdowns in a 26-10 win at Arrowhead Stadium. He's proved in the past that he can be productive for owners, but Locker's Achilles heel has been his proneness to injuries. If he can remain on the field, he has upside. He'll also be a nice matchup-based starter in Week 2 against a swiss cheese Dallas defense. I tweeted on Sunday morning that Hurns was a player to watch in Week 1. I never expected him to go off like he did against the Philadelphia Eagles, however. The undrafted rookie posted four catches for 110 yards and found the end zone twice, scoring on pass plays of 34 and 21 yards. While these sort of numbers will be hard to duplicate, Hurns is worth grabbing based on potential. I don't know what happened to Trent Richardson between his rookie season and now, but he's not the same running back anymore. And if the Colts want to win games, Bradshaw is going to see more work in the backfield. He played well in Week 1, posting five receptions and 85 scrimmage yards in a loss to the Denver Broncos. I wouldn't be at all surprised if Bradshaw passes Richardson on the depth chart. Jennings might not be the top fantasy wideout in Minnesota, but he can still do some damage in the stat sheets. He proved that against the St. Louis Rams with six catches, 58 yards and one touchdown. Jennings has a nice rapport with his quarterback, Matt Cassel, which was apparent in the final weeks of the 2013 season, and he's well worth a roster spot in fantasy leagues heading into Week 2. Remember when Smith was one of the top wide receivers in fantasy football? That was a few seasons ago, but he proved in Week 1 that he still has some value for 2014. The veteran went off against the Cincinnati Bengals, posting seven catches for 118 yards and one touchdown. While I don't expect Smith to re-emerge into an elite fantasy wideout, he's still rosterable as a reserve and matchup starter. Eddie Lacy suffered a concussion in the NFL's season-opening contest in Seattle, so his status for a Week 2 game against the New York Jets has to be considered a question mark. Enter Starks, who would be next in line for carries in the event that Lacy is unable to suit up. If you drafted the Alabama product in the first round, you should grab Starks as a handcuff even if Lacy is cleared. Someone has to catch passes in the Browns pass attack, right? In Week 1, that player was Hawkins. He caught eight passes for 87 yards and had six more receptions than anyone else on Cleveland's roster in a loss to the Pittsburgh Steelers. Hawkins, who flashed during limited work with the Cincinnati Bengals, is well worth a look if you need depth at wide receiver. He could be a nice PPR option. Allen didn't get a lot of press during the preseason, but he's one of the more talented young tight ends in the NFL ... and he proved it in Week 1. The Clemson product caught four passes for 64 yards with one touchdown, a 41-yarder, in a loss to the Denver Broncos. Allen, who has scored in each of his last two games dating back to 2013, should be added if you need some tight end help.